Great gift idea for Grandmom or Mom. 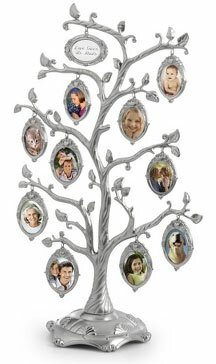 Bring your family heritage to life with this beautiful gift that allows you to literally create your familytree in photographs and with a unique message. Ten doublesided photos are handcrafted with brushed nickel plating for an “instant heirloom” look. Of course, with your family name, and maybe a favorite expression, this gift is destined to become an heirloom. Allow your grandmother and grandfather to relive the golden radio era and great moments in history. They can step back in time a few decades, allow themselves to be transported to when radio greats captured the hearts and imagination of millions of listeners, to a time before television and multiplex movie theaters to when radio was the primary form of entertainment and news source. These compelling collections transport you through history in all its good, bad and ugly glory. Painstakingly restored, these CD’s offer a glimpse of the past as it was heard by those who eagerly sat next to their radios to hear the news or to be entertained. Listen closely as history unravels itself in this collection of riveting radio news from the front lines of The Greatest Conflict. In chronological order you can experience the all-encompassing drama of world events that unfolded as nations became engulfed in this great conflict. Every moment is accounted for, from the Declaration of War, to the Victory Celebrations in this 20 Disk set. Relive your experience, or experience for the first time, Great Moments in Sports with this collection of original broadcasts of radio shows and sporting events. Cheer on your favorite in the 1949 World Series Game, or entertain yourself with interviews of such great athletes as Babe Ruth and Joe Louis. Be entertained with collections by the radio masters who were able to captivate the imaginations of millions every night with their shows. 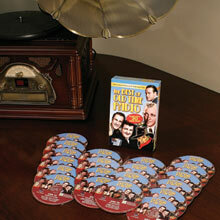 Laugh again at the humor of Abbott & Costello and Bob Hope. Be thrilled with the suspense of classic shows like Perry Mason. Cheer for your childhood hero’s Superman and The Lone Ranger. You can buy them on this site. 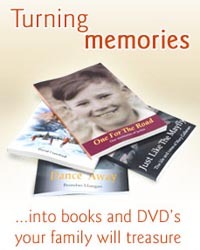 This is a great gift for older family members like parents and grandparents, you can now capture their memories of what their childhood was like, and how they met and fell in love“ memories of your family and its history which would otherwise be lost forever can now be passed down from generation to generation with these great autobiographies.